The Week in HD - Tuesday 27th August | What Hi-Fi? Bank Holiday Monday was made all the more special thanks to the broadcast of the Doctor Who Proms, which you can catch up with on BBC iPlayer. This is the third Prom dedicated to the world's longest-running sci-fi show. It focuses on Murray Gold's beautiful compositions from the most recent series, and includes special sound effects from the BBC Radiophonic Workshop. 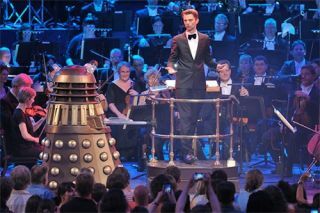 There's also an array of old and new monsters – and Doctors, including Matt Smith and Peter Davidson – invading the audience. Brilliant. Bread. The dreaded bread round is here, and Paul Hollywood will be looming and scrutinising and shaking his head in disappointment at everyone's ball of dough. The 12 contestants have to bake 36 bread sticks, the perfect English muffin, and, I quote, "the most outrageous showstopping loaves of bread ever seen on television". Who doesn't want to see Paul the Psychic Octopus in bread form? It's semi-finals week, and eight will become six by the end of the first dish! The remaining six contestants cook for the soldiers taking part in the Wars of the Roses reenactment, using ingredients that would've been popular during medieval times. Watershed. It's the series five finale, and Kate Beckett is offered the job of a lifetime in Washington. Could this spell the end for her relationship with Castle? And will the body in the water tank be her last case with the 12th precinct? Castle fans: definitely tune in for a jaw-dropping cliffhanger. Serve a world-class three-course meal for the 150-plus students, parents and fellows at the end of term banquet at Cambridge University? Easy. Afterwards the final six contestants are told to create a dish inspired by someone in their lives – a dish that shows their passion and emotion through food. Invisible Worlds. Dara and his team put the unseen world under the microscope, from microbes to nano-technology. Dara takes on a computer in identifying whiskeys, Mark Miodownik tries to create the world's toughest material using tips from nature, and gravity-defying liquids are played with. It's the most daunting challenge yet: cooking for the critics. The final five have to cook to perfection for three of the country's most feared restaurant critics for a place in next week's final. Highlights from this year's Reading festival, including performances from Green Day, Frank Turner, Biffy Clyro, Alt-J (above) and Nine Inch Nails. Robert Carlyle, Emily Mortimer, Meatloaf and Samuel L Jackson are in this movie. Does the plot even matter? Jackson plays an American master chemist (with a Scottish heritage and a love of golf) with a new drug to sell, while Meatloaf is his old boss wanting revenge. He hires an assassin (Mortimer) to kill off Jackson, but is intercepted by her ex-lover, Carlyle, who just wants to get to the Liverpool v Manchester United match. Got all that? Silverstone. Is there any stopping Marc Marquez? Doesn't seem like it. As we head to Silverstone, are we going to see another spectacular win from the young Spaniard? Or can Brit Cal Crutchlow become the first home-grown winner since Barry Sheene in 1981 – in his home race, no less? The movie that made flying cows a staple of 90s pop culture. A group of tornado chasers go and, um, chase a tornado. With a new gadget. Starring Bill Paxton, Helen Hunt and Philip Seymour Hoffman. Before Johnny Depp decided playing variations of Captain Jack Sparrow was a good way to spend the rest of his career, he used to be a proper actor. A fine one, too, in his portrayal of real-life drug baron George Jung who became the cocaine king of USA in the 1970s. Also stars Penelope Cruz and Ray Liotta. Action heroes of the 80s and 90s join up in this testosterone-filled ensemble to recapture the glory of proper action films. It's like the i-generation never happened. Smartphones and nanotech and lens flares? Pah! Have some good ol' fashioned explosions, gunfights, and the sound of knuckles hitting flesh. And cheesy one liners from muscle-clad men. And Jet Li.